New and recently completed infrastructure projects are without a doubt a key factor in driving up the value of existing houses in suburbs right around Australia. But how infrastructure impacts the property market is often misunderstood by novice investment ‘gurus’ and other property investors. Projects that create long term employment are a positive for the market, but projects that don’t create jobs are not going to have any sustainable impact. This is why road construction or mining activities that are a short-term play will not have a strong or sustainable flow on effect. Many market spectators, or speculators also get too caught up in projects that are proposed, or just a business case and make half a million dollar property decisions on projects that may just be a political talking point and never come to fruition. Anna Porter, valuer, property commentator and Suburbanite CEO has taken a look into the areas with new infrastructure that will help continue to drive property prices, and she sorts the impactful projects from the ones that may just be a flash in the pan. “Adelaide is the benchmark example of projects that are a catalyst for underpinning a robust and sustainable property market. The projects coming out of Adelaide are creating jobs as well as encouraging people to move to the area to set down roots, which is set to boost internal migration to the very liveable city,” says Porter. “These projects such as the hospital will not only create jobs internally but there is a flow on effect to the businesses outside of the hospital such as cleaning companies, cafes, florists and the general supply chain to the hospital. This will create spending in the local economy as well and a thriving economy will result in a thriving property market. “says Porter. “The Royal Adelaide $2.4 billion hospital is now open and the city is already reaping the benefits of jobs coming out of this project. The next major project, being the defence contract for manufacture and maintenance of military boats out of Port Adelaide will be kicking off, as well as the recent announcement by Lionsgate that they will be adding another 1200 jobs to the former Holden site with renewed manufacturing activities in batteries and other innovative sectors,” says Porter. “Contrary to Adelaide, Tasmania has put forward a number of projects as a concept or proposal but so far very few are set to turn soil. Some property commentators or speculators are putting all their eggs in the Hobart basket, but this is considered fraught with danger,” warns Porter. “This is in-line with past employment drivers for the area withjobs growth from Aug 2017 to Aug 2018 being only 2,600 jobs, which only represents a 1.06% increase on the total. Average jobs growth for Australia was 2.47%, meaning Hobart significantly underperformed over this time and based on the research this will continue to occur into the next 3-5 years based on the proposed pipeline,” says Ms Porter. The state pipeline paper(project summary below) shows that upcoming projects are only sitting at a 30% conversion rate of the proposed pipeline. 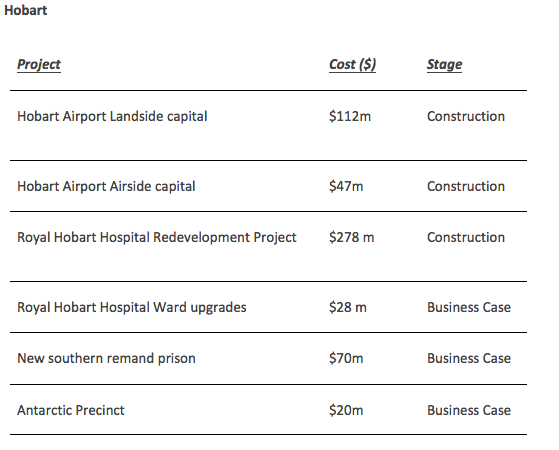 Out of the 10 projects tabled only 3 have been approved for construction and the rest remain as business cases that will likely remain a political talking point. “Projects that are getting through the gate keeper are still not what we want to see for a filter down effect into the property market. Such as Battery Of The Nation which includes windfarms and solar initiatives are also not significant job creators for the long term and the flow on effect to the property market will be minimal,” concludes Porter. 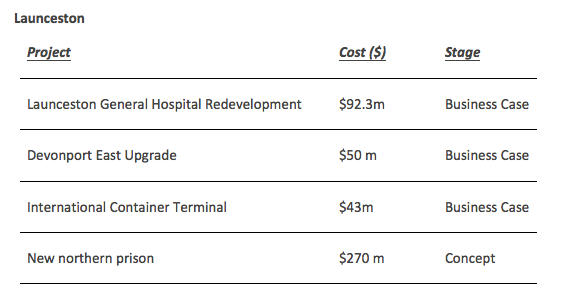 “Most commentators have eyes on the $710 Mil metro light rail project, but this is not the most valuable project to Canberra in terms of a flow on effect to the property market,” says Porter. “The projects that are more notable include the Canberra U-Public Hospital and Defence Academy, both will attract jobs or students which is a boost to the economy and population capture,” explains Ms Porter. University of Canberra Public Hospital is currently under construction at the university campus in Bruce. The $212 million state-of-the-art teaching hospital will be capable of accommodating 140 patients, as well as an additional 75 day places and outpatient support. The hospital will help support Belconnen’s growing population, as well as provide a number of jobs for the local economy. Australian Defence Force Academy near the University of New South Wales Campus recently underwent major redevelopments and upgrades to draw in a new range of students and cadets. Additionally, UNSW is considering establishing a second Canberra campus in Reid, which could potentially attract an additional 10,000 students to the city. “The $16b railway project known as the North East Link will improve congestion in and around the city and between north Melbourne, increasing the liveability outside of the CBD but certainly won’t be a game changer for the residential real estate market,” Says Porter. Next post: Unpacking the ‘missing middle’ planning policy. How this NSW Government policy could devalue your property.